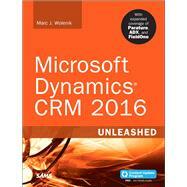 Microsoft Dynamics®CRM 2016 Unleashed presents start-to-finish guidance for planning, customizing, deploying, integrating, managing, and securing every new Online and On-Premises version of Dynamics CRM 2016. Leading Dynamics implementer Marc Wolenik presents comprehensive coverage of configuring, customizing, and operating Dynamics to serve your organization’s unique needs. He illuminates Microsoft’s renewed focus on services, via the Interactive Service Hub (ISH) and advanced cross-platform mobile client support. You’ll also find extensive new coverage of key enhancements including xRM, Adxstudio Portals, FieldOne, Parature, Voice of the Customer, and FantasySalesTeam gamification. In addition, this book is part of Sam’s Content Update Program. As Microsoft updates features of Windows 10, sections of this book will be updated or new sections will be added to match the updates to the software. The updates will be delivered to you via a free Web Edition of this book, which can be accessed with any Internet connection. Wolenik’s example-rich guidance will be invaluable to every IT professional who intends to work with Dynamics CRM 2016, regardless of her experience with Dynamics, Salesforce, or other CRM solutions. Drawing on extensive insider knowledge, he systematically explains how Dynamics CRM 2016 works, why it works that way, and how to maximize its value. You’ll find proven best practices for using every significant Dynamics capability–information available in no other book. Marc Wolenik has been involved with customer relationship management systems for more than 20 years and Microsoft Dynamics CRM since version 3.0. His experience led to the creation of Webfortis (recently merged with Avtex), one of the largest Microsoft Dynamics CRM partner firms in North America.